Seen above is a picture that is practically screaming for change. A little over 24 hours ago I sat down in my cosy cinema seat at the Stratford Picture House with my £7 ticket in one hand and my £1.95 bottle of water in the other, hoping for a film that was going to enlighten and inspire me. I couldn't have been more naive. This film shook me to my core. It angered me, it frustrated me, it made me want to leave the screen kicking and screaming and begging for change. I'd sat for an hour and forty minutes and learnt more about the benefits and welfare system than I had in my whole twenty years of existence. This is just an outrage. I'm angry at myself for being so blind to what is going on right under my nose! Let me give you a rundown of the film. Daniel Blake, a man from Newcastle, has had a heart attack. His doctors are telling him he cannot work and yet after an impersonal test by a "qualified healthcare professional" he has been deemed "fit to work". His only option is to appeal the outcome which he can only do by calling a premium rate number and listen to "shite music" on the phone for one hour forty-eight minutes (an experience I'm sure we're all well acquainted with) only to be told, when he finally gets through, that he has to "await a response from the decision maker" aka "it's not my problem". Daniel's options are pretty much down to zero, so he heads on up to the dreaded job centre in hope of finding some kind of clarity on what his next step is. Upon arriving, a scene is kicking off between a young single mother of 2, Katie Morgan, and Sheila, an awful woman who works at the job centre. Daniel and Katie strike up a friendship and the film pretty much follows the two of them combating the struggles of day-to-day life on this below the line lifestyle. 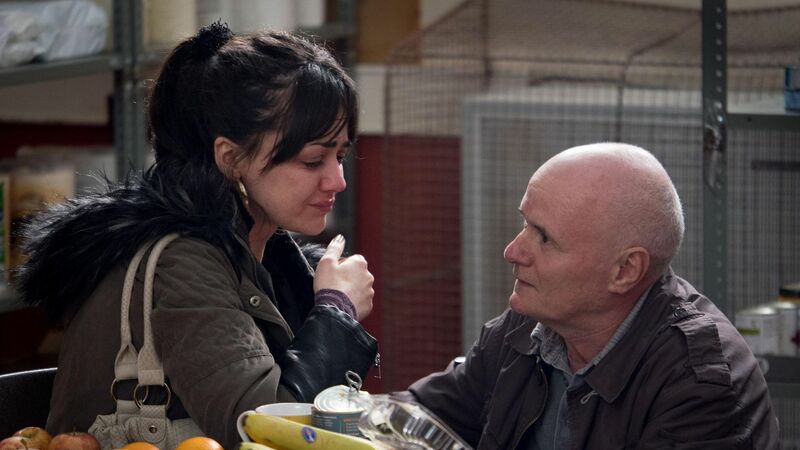 A heart wrenching scene that kicked off my tears was watching Katie receive help shopping at the food bank. Given a private moment alone whilst the woman turns her back to grab her some pasta sauce from the shelf behind, Katie rips open a tin of cold baked beans and, using her hands, shovels it into her mouth as quickly as she possibly can. The woman catches sight of her, as does Daniel, and the two rush to help her. Her little girl, who's been watching from afar, comes to her side to offer support. Earlier in the film we see Katie prepare food for her two children and for Daniel himself, but says she ate earlier and instead eats just an apple. Hardly a substantial meal. It's a scene I'll replay over and over in my mind because it just makes me so sickened to know that there are people in the world who can't receive the basic human right of food. The thing we survive on, the thing we nourish our bodies to push us on to the next day, is deprived from a woman with two children who's been moved from London to Newcastle and denied her appointment at the job centre for not knowing where she's going in a brand new town, who is then "sanctioned" for trying to explain herself. What a way to make someone feel like a complete and utter waste of space. Another scene that had me clutching my hair in frustration was watching Katie get caught stealing sanitary towels, razors and deodorant from a newsagents. A woman who cannot afford toiletries to keep herself clean during an involuntary act once a month... disgraceful and the leader of this country, a woman, should show a hand of compassion and reach out to do a better job of making this no longer an issue. I think something nibbling away inside of me is that this film isn't even widely accessible. It's not like your latest Spielberg film that you'll find at your local cinema with a bunch of different showings in the same day. I, Daniel Blake is being shown at a very few select cinemas across the UK. If you google I, Daniel Blake it should come up with a list of the places closest to you where you can see it. However, of 771 cinema sites and 4115 screens in the UK (as of 2015), you'll only find this masterpiece on 60 of those screens. That's right, ladies and gentlemen. 60. Because we've got to silence those with a voice, even filmmakers. How dare they speak out against the injustice of the state. How dare they try to expose the completely impersonal and outrageous system. I wish I didn't feel so helpless. At least I can find solace in my memory of Screen 4 at the Stratford Picture House, jam-packed and a round of applause through stifled tears as the credits rolled. However as the screen fades to black and we all flood out, reality still exists and this system continues to be put into place every day. People die every day because of the welfare system in this country and the fact that it is allowed to continue to happen every single day... well it just makes my blood boil with rage. I'd love for you to click here and find a local food bank and have a look at their list of what they're lacking at the moment and find it in your heart to set aside a few pounds during your next weekly shop to help them provide for those living below the line. Ladies, next time you buy yourself some sanitary towels (I know they're stupidly expensive) but please maybe consider buying an extra pack to give to the food banks, people never think to donate them and so they're always lacking. There are many many beautiful articles flooding the internet on this piece of film right now but two in particular that I'd like to share with you are this one by Jack Monroe and this one by Mark Kermode. Please spare a couple minutes of your day to have a read of them both, they are both beautiful pieces that I think are so necessary to gaining an insight into this cruel cruel world we live in. p.s. all photos/videos on this post do not belong to me - the rights are reserved for their rightful owners.